neither of my Syncros are really solidly stopping the rolling back by putting on the handbrake. The Hightop Danbury has all new brakes and recently Brian at Stationworks Garage had it in to resolve this. He said nothing wrong with them, perhaps wearing them in a bit would help. Its not made any difference yet and I have driven it lots. I adjusted the rod and that helped slightly. My feeling is, (based on my experience of cable brakes) the cable is old and stretchy. Its just about the only bit left to replace anyway. and wait until an inevitable brake upgrade maybe later this year. But sometimes I get out after putting the handbrake on, and it creaks and rolls a little...!!! Truth is I am not sure what to do, I want the best handbrake I can get, how do I get it? What is the best plan for the future in terms of brake upgrades. This applies to both Syncros. They both have standard drum setups at the back. but which setup will give me the lock on handbrake? Ignoring the potential change to discs check the dimensions of your drums. 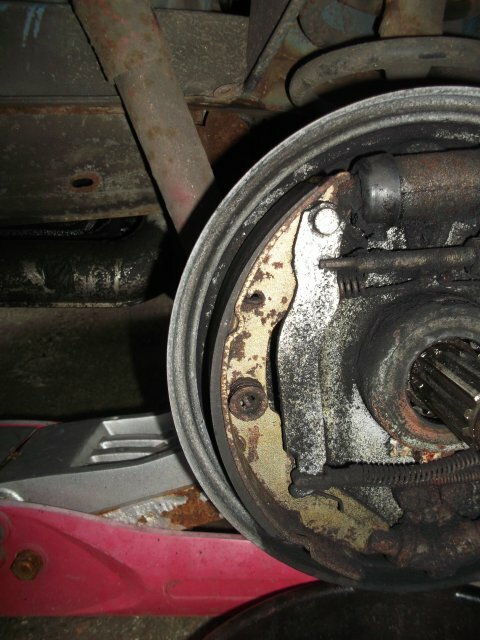 Weak handbrake can be the result of oversize drums, even worse if the wear is so bad the piston can pop out when shoes are worn. I replaced the drums on my Autosleeper last year, they were still bedding in when I had to park on a 1 in 3 hill. It held. Other than that, new cables and make sure the normal mechanism is adjusted correctly inside the drum. ps many vehicles with discs on the rear still have integral shoes / drum for the handbrake, just smaller than a full size drum setup. The handbrake will hold well if it is set up correctly. Firstly the handbrake cable must be slacked off before the brake shoes are adjusted and the brake shoes must be manually centralised when they are fitted, they don't easily self-centre and this happens. Not all the shoe makes contact with the drum. Thanks, all good points and I'm listening. 1 in 3 sounds good! is that the technical term? I will make sure to order cables and drums to replace the old ones next week. Mine failed mot on hand brake last week. Fixed by manually adjusting the shoes. Self adjusters hadn't done their stuff. Now it holds on our very steep drive. Totally confident in the handbrake for the first time! george2490 wrote: Totally confident in the handbrake for the first time ! Aye, the automatic adjusters may or may not work depending on how freely they move and how much brake shoe dust has accumulated on them since. I've never found them to be particularly good so I always wind shoes out prior to an MOT by default, and if I'm doing a service on mine. The difference it makes to braking action is incredible. On reading your original post I was going to suggest checking for drum wear but that's already been covered. You might also check rear wheel bearings since wear there will allow the drum to be out of parallel with the backplate and shoes meaning potential for only the edges of the shoes to contact. One other area to check is where the main cable/pull rod runs back from the handbrake lever. Not very far back the cable passes under/through a plastic/rubber bearing block, changing the run from the down angle to being parallel with the van floor. My handbrake was not so great and I got a loud creak when applying it. A clean up followed by a dab of grease on this bearing block stopped the noise, made the brake application much easier and the brake held much better, too. I'd think the shoes would pull the drum pretty true Gary ? A lot of it is them accurately matching the drum over a large enough area? And freedom of movement and adjustment of the whole cable system. it had next to no handbrake! except after 15 miles I checked the temp and one side cool the other red hot. Took it back and they adjusted it off, but its not holding on a slope. they said they dont look worn. except its tempting to consider upgrading the brakes if so. 1 in 3 with original equipment, you don't need an upgrade, you just need things checking and adjusting correctly, nothing wrong with the standard drums as a handbrake. The clue for me was when I couldn't get the brake adjustment after replacing retaining springs and one of the pistons popped out of the slave cylinder. I thought, I've seen this before on a Clio, the drums were oversize, auto adjuster not working, measured the drums, replace, all is wonderful and the brake pedal stops going long. Checked the dimension on the T25 drums and they were oversize. Shoes looked almost new. Now I know you "should" put new shoes on with new drums, but I reckoned that if I removed some material from the lead and trailing edge of each shoe the radius of the shoe would reduce to match the new drums. It did, and on my drive up to the Highlands the brakes bedded in and both hydraulic and cable brakes got better. I did manually adjust the auto adjusters before leaving. I had the handbrake lever arm on one brake shoe seize up which resulted in a weak handbrake.